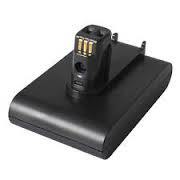 VLI-106 : 22.2 volt 2.0AhAh Li-ION battery for Dyson DC31, DC34, DC35, DC44 vacuums. Replaces battery #s 917083-01, 917083-05. VLI-106 : 22.2 volt 2.0Ah Li-ION battery for Dyson vacuums. Fits DC31, DC31 Animal, DC31 Car & Boat, DC34, DC35, DC35 Animal, DC35 Exclusive, DC35 Multi Floor, DC30, DC31 Animalpro, DC34 Animalpro, DC44 vacuums. Replaces battery #s Type A, 917083-01, 917083-05.